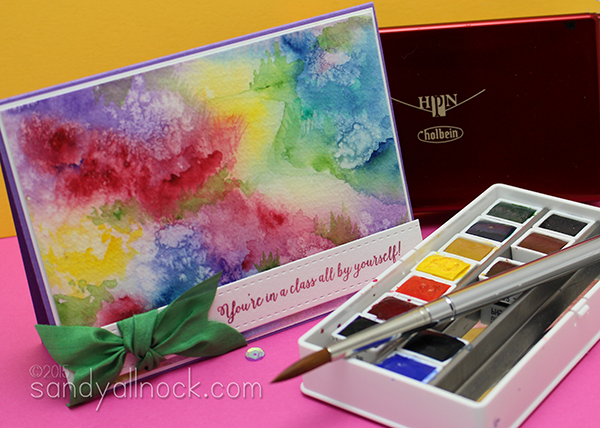 Hello friends – and welcome to number 7 in my watercolor series – as well as a really fun Watercolor Bloghop hosted by my friend Paulina over at Pretty Pink Posh! Today’s card is an idea that evolved over a long period of time; I saw mention on some kids art blog post eons ago about using salt with watercolor. They didn’t show visuals, just mentioned it as something to try. And I saw it also on someone’s art journal technique list. Again, no visuals. The idea stuck in my craw, though, and I decided to play with it and see what happened. A full day of experimenting ended with this card well after dark…..and it was worth a full day to get here! Enjoy the video below, or click HERE to watch in HD on YouTube. How crazy is that whole salt idea!? Oh Lordy. I wonder how someone stumbled on the idea. An accident at a lunch counter maybe? In any case, I *adore* the technique. I’ve got more in store to use this for other projects, so stay tuned in coming weeks! Beautiful. Love the colors and the technique. Pretty card! Can’t wait to try this! it is amazing how beautiful a simple- not-so-simple colored background can be! Thanks so much for the inspiration and will be back to check out the videos after hopping! Beautiful–love the salt on water color technique, such a cool effect! Simply breathtaking! Adjectives hardly cover how beautiful this is! Elegant, watercolor perfection. FABULOUS!!!! So fun seeing your process! I’ve not tried this but it looks like fun! Beautiful, amazing card! I’ve heard of the salt technique also. Off to watch your video now! Wow! Gorgeous card and I so appreciate your videos! Thanks for being so generous with your abundant talent!! Fun, cool, and just so amazing looking!! You did a super great job on this!! Love, love, love this card!! The techinque is fabulous. A bit outside my comfort zone, I think, but that’s the point, right? Thanks for sharing!! Oh ,my!!! Your coloring is STUNNING! So artistic, seriously, something that should be framed! What a fabulous technique Sandy! Your cards are always so much fun! Total beauty and a true work of art! Absolutely gorgeous! I remember my grandmother talking about using salt on some of her watercolor paintings! I’ve never tried this technique myself, but your painting has inspired me to give it a try. Thank you for the wonderful video. Your painting is gorgeous! I loved watching you create this card in your video. This is a striking card/work of art! The salt technique I’ve seen and remember doing in school. Your vision, however, was harder to see until you started adding all the details. I saw the path; do I get credit for that? I need a better eye. It also explains why you’re the artist and I am not…. I agree with Sonja that it is reminiscent of Monet’s garden. Nicely done, as always. WOW! This is so beautiful. I have to agree with the comparison to Monet. I have heard of salt but never anything about a lost and found technique. Thanks so much for sharing. Your video was great. Really fabulous! Such a great idea and you really did a wonderful job with it! Thanks so much for sharing! FYI, I had a hard time finding where to comment. I know that if you’re like me you might be using a design developed by someone else for your blog, but I just thought I’d mention that it’s a bit challenging to find where to comment, in case you were interested in getting feedback. The colors on this cars are so vibrant, I love them. Great looking card! I love your color choices, and the salt technique is a fun one I often forget about. Such a quick a easy way to get a cool background! Thanks for sharing! Sandy, your painting is gorgeous! Actually, using salt with watercolor is something a lot of professional watercolor artists do, so it’s not just for kids. When you mentioned about letting your brush “dance,” it reminded me of my organ teacher in college. When I was playing Baroque music, she used to tell me to “dance on my toes” when I played the pedal board! I haven’t thought of that–or her–in a long time. She was one of the genuinely good people in the world. Thanks so much for sharing your beautiful painting! Gorgeous! When I looked at your card the first time I did see the flowers. Wowzers! This is amazing, Sandy! So colorful, Sandy! I love it! 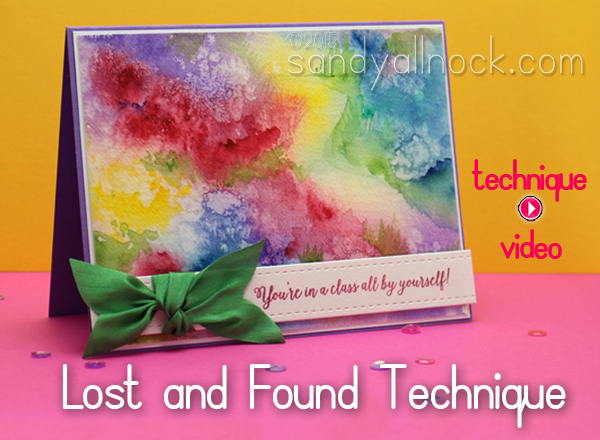 Great card along with wonderful water coloring technique. Thanks!